Tuesday’s runoff election brought to a close aldermanic battles in 15 wards across the city. In many of those wards, incumbent aldermen fought for their political lives – including the 40th Ward on the North Side, where veteran Ald. Patrick O’Connor lost to democratic socialist Andre Vasquez. But in four wards, runoff candidates fought for seats left open by aldermen who are stepping down from City Council – for a variety of reasons. In the 20th Ward, Jeanette Taylor, who helped organize the Dyett High School hunger strike in 2015, defeated former teacher Nicole Johnson. Since the 1980s, three former aldermen of this ward have pleaded guilty to federal corruption charges: Arenda Troutman, Cliff Kelley and Willie Cochran, who pleaded guilty last month to federal corruption charges tied to misuse of campaign cash. In a particularly contentious battle in the 25th Ward, Pilsen community activist Byron Sigcho-Lopez, who was born in Ecuador, defeated Alex Acevedo, the son of former state Rep. Edward “Eddie” Acevedo candidate. 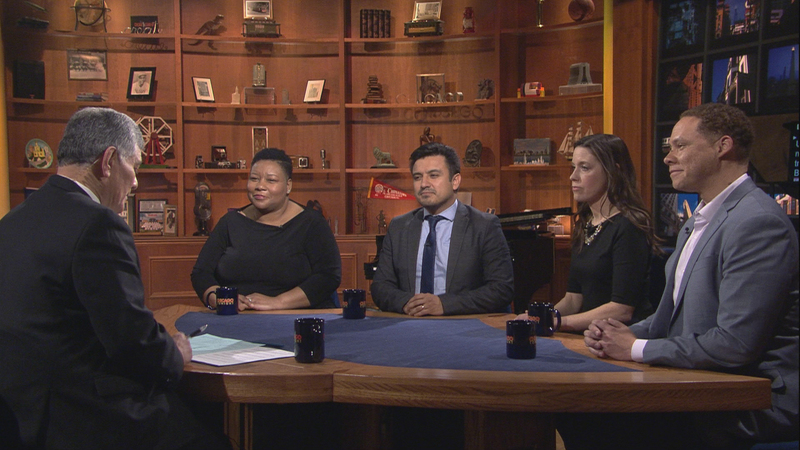 Alex Acevedo received money from Chicago Forward, a super PAC connected to Mayor Rahm Emanuel; allegations of voter fraud were directed at Sigcho-Lopez’s campaign. That seat was left open by Ald. Danny Solis, who announced in November he wouldn’t seek re-election. Solis has been out of the public eye since it was revealed he cooperated in a federal criminal investigation into longtime Ald. Ed Burke and that Solis himself was the subject of a federal probe. In the 39th Ward on the Northwest Side, Samantha “Sam” Nugent, former director of operations for former Illinois Attorney General Lisa Madigan, defeated architect Robert Murphy for the seat left open by Ald. Margaret Laurino, whose retirement ends a political dynasty that lasted more than half a century. Laurino was appointed by former Mayor Ricahrd M. Daley in 1994 to fill the 39th Ward seat of her father, Ald. Anthony Laurino, who was first elected to the ward in 1965. In the 47th Ward, attorney Matt Martin defeated Michael Negron, Emanuel’s former chief of policy who also received campaign contributions from Chicago Forward. As an attorney at the Illinois Attorney General’s Office, Martin took part in drafting the federal consent decree overseeing the Chicago Police Department. The two fought for the seat of retiring Ald. Ameya Pawar, who placed a self-imposed a two-term limit on himself. Pawar, meanwhile, was seeking the office of city treasurer and faced a runoff with state Rep. Melissa Conyears-Ervin, who won that seat Tuesday.